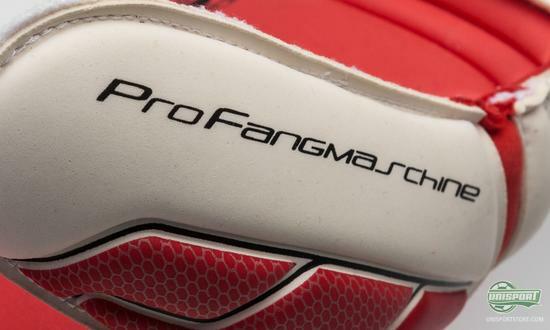 The German goalkeeping specialists from Uhlsport have just unveiled the new Fangmaschine Absolutegrip, which is equipped with all of the best technologies, hidden in Uhlsports box of tricks. The new top glove will be worn by Tottenham goalkeeper Hugo Lloris, when he guards the goal in the Premier League. 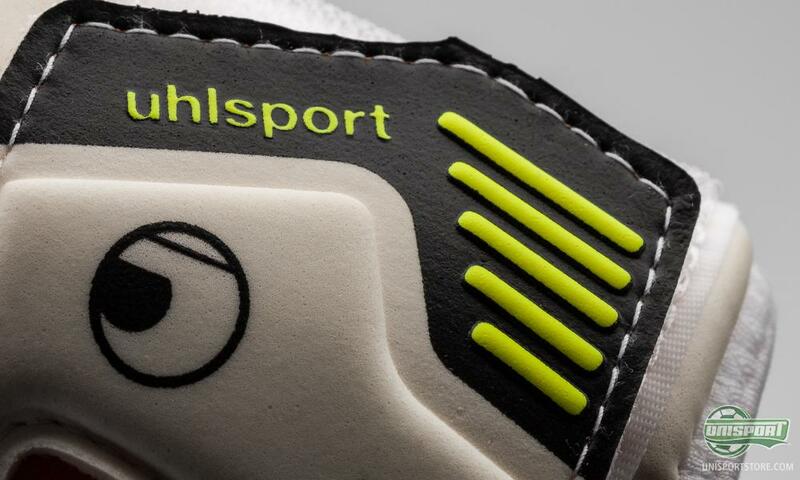 German Uhlsport are among the biggest brands, when it comes to kitting out goalkeepers. Year after year, they deliver to some of the worlds best goalkeepers, and that is no surprise, when you look at their impressive products. 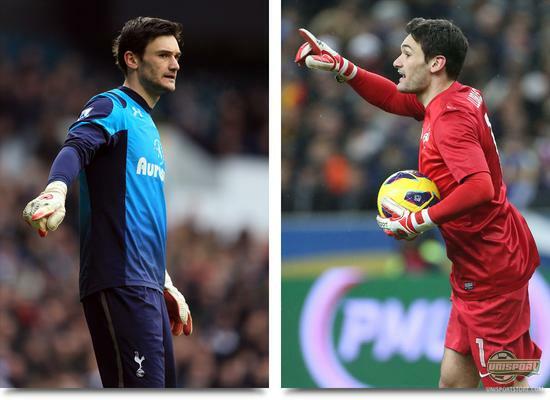 Now they have launched a new top glove; Uhlsport Fangmaschine Absolutegrip, which Hugo Lloris will be using from now on. Uhlsport Fangmaschine Absolutegrip picks up where the old model left off, which design wise was also dominated by the red latex in the palm. The red colour has, if even possible, gotten an even more prolific role, as it now also is to be found on the top of the glove. 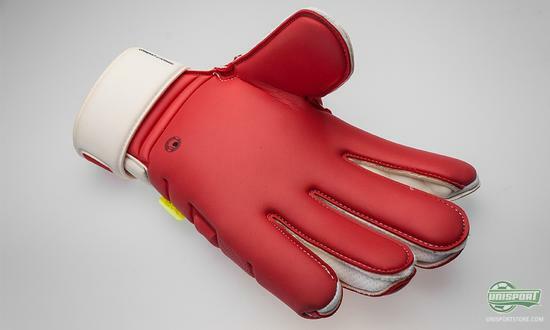 This may very well be to give Hugo Lloris an even better opportunity to match it with Frances goalkeepers set, which is, as depicted, also predominantly red. Uhlsport manage to combine modern design, with innovative technologies, but without compromising on the Fangmaschines original, and much loved parameters; comfort, classic fit, and superb latex. 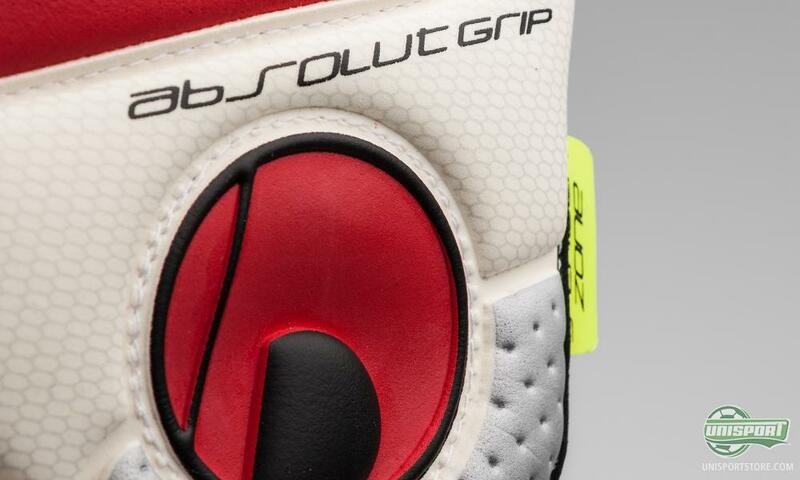 This is why they have chosen to use the Absolut Grip-latex, which is described by Uhlsport themselves, as their finest latex. 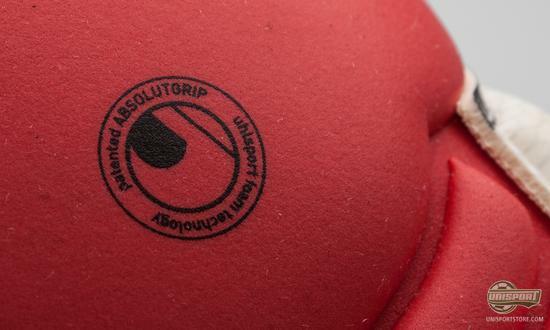 It is 4,4 mm thick, which is relatively much, but this serves to give you an unmatched comfort, second to none shock absorbency, and phenomenal durability. This has made it so popular among Uhlsports professional keepers, that 80% of them use gloves with Absolut Grip-latex. 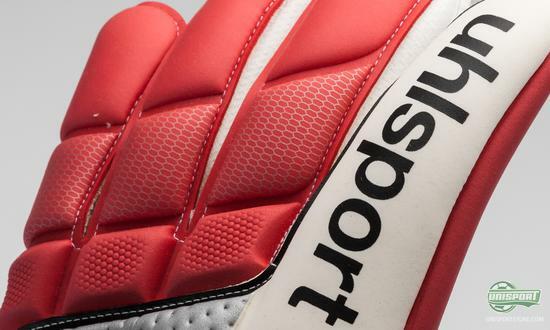 Uhlsport call their Fangmaschine the most traditional, and classic goalkeepers glove in their vast range, and this claim is backed up, when you look at the cut that has been chosen. 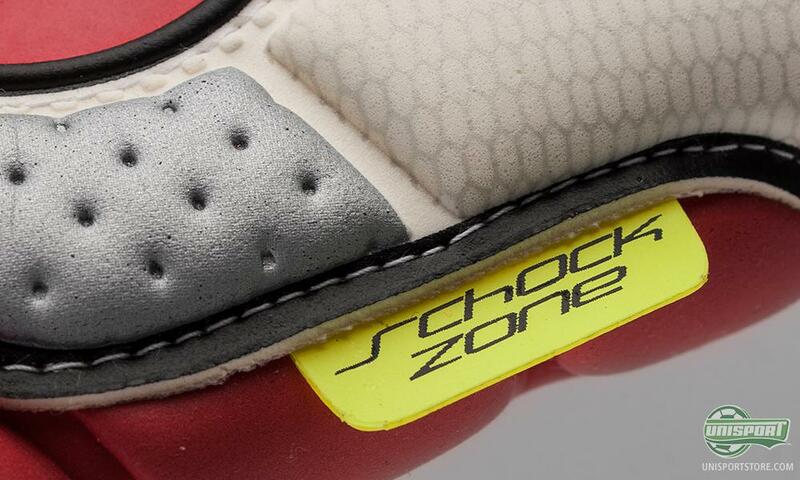 It is a Flat Finger-cut, which Uhlsport call their classic Cut. It means, that the latex from the palm of the glove, and the latex on the top of the glove, has been stitched together between the fingers, as you might be able to gather from the picture above. 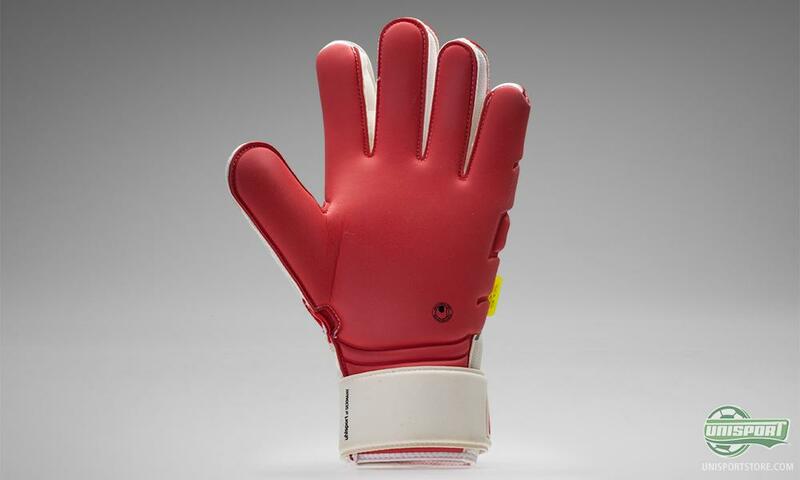 This gives a wider, and more comfortable fit for the fingers, which is something many goalkeepers prefer. Around the knuckle area on the Fangmaschine Absolutegrip, the glove has been equipped with Uhlsports Schockzone-technology, which is there to give both increased comfort, as well as, improved protection when punching the ball away. This also makes the glove significantly sturdier, as it is more receptive to the many knocks and hits, which you will inevitably get as a goalkeeper. 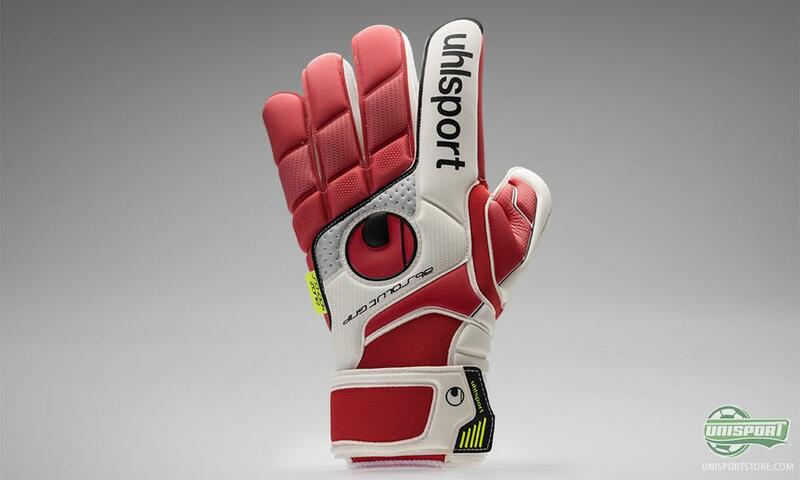 The Uhlsport logo is in itself a mark of quality, but this is only truly understood, when you are holding the gloves in your hands. The latex leaves a lasting impression, and you quickly realise, why Uhlsport have patented it, because it really is in a class of its own. Uhlsport Fangmaschine Absolutegrip will definitely be a big hit, and when the French national teams goalkeeper Hugo Lloris advocates it, you really can't get better a stamp of approval. What do you think about the new glove? Could this be your next weapon, in the fight to keep clean sheets? Share your thoughts in the comment-section down below.